Saturday was my final Short Course Blitz in Los Angeles County. 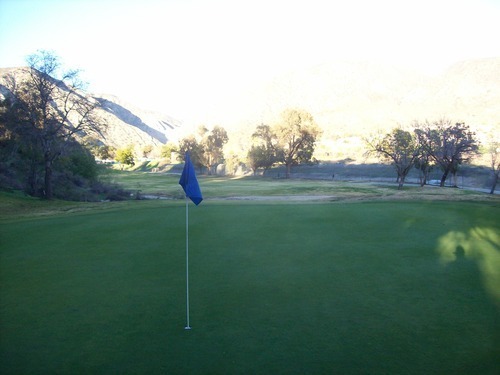 I had five courses left on my list in this area, and after a bit of a marathon day (and night), I was able to play them all. I knew this grouping was going to present a long day. 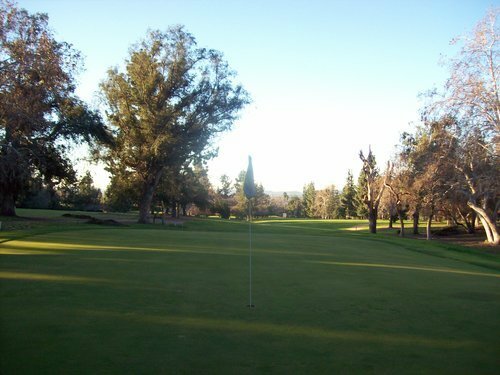 Some of the courses I had to play are known to draw plenty of crowds and, all-told, it would end up being 72 holes of golf. So, I purposely procrastinated and saved this region for last. I showed up around 6:30 and there was already some action around the clubhouse. There were players warming up on the putting green and the pro shop was already open for business. I checked in and paid my $20.25 walking rate. The nice guy inside let me know I could head out when I was ready and jump ahead of some other groups that were going off soon. It couldn’t have worked out better as the start of such a long day of golf. Pace was not an issue as I made my way around without any problems. I got to test out my new iPhone 6 camera, which did way better in the low-light conditions than my old digital camera. However, it didn’t do quite as well once the sun started coming out, so the photos below are a mix from both cameras. 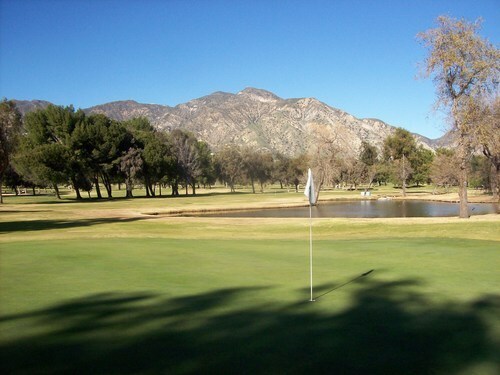 Eaton Canyon is a par-35, regulation-length 9-hole course. 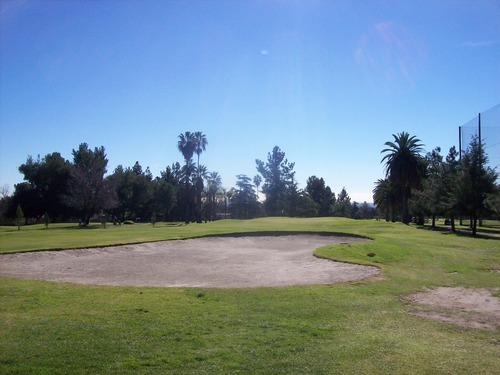 It features two par-5s and three par-3s, with most holes being of pretty traditional design and length. So, it’s really just half of a normal course. My only real issue with the layout is that all of the par-3s play to pretty similar lengths (in the 170-yard range). It would have been nice to see more variety on those holes. 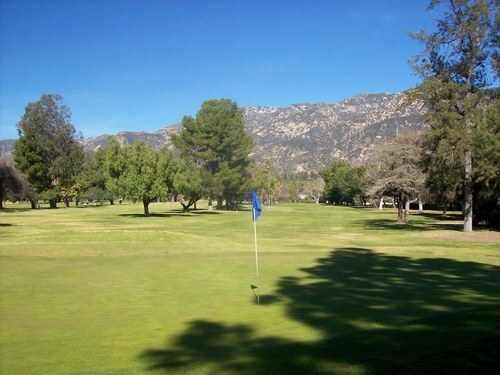 Otherwise, the setting at Eaton Canyon definitely outshines the layout itself. Set up in the foothills along the San Gabriel Mountains, you get some very nice views down into the valley and back against the rugged hills and peaks. 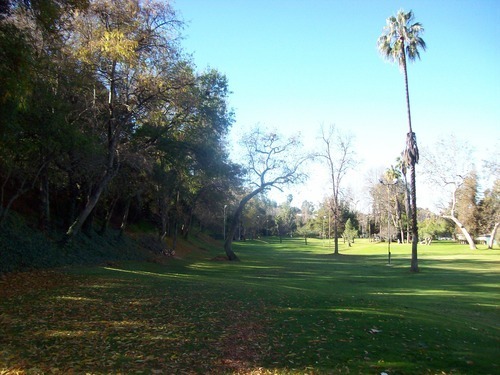 The course is lined with old trees and has some slight elevation changes throughout as you start going down the hill and then work your way back uphill at the finish. 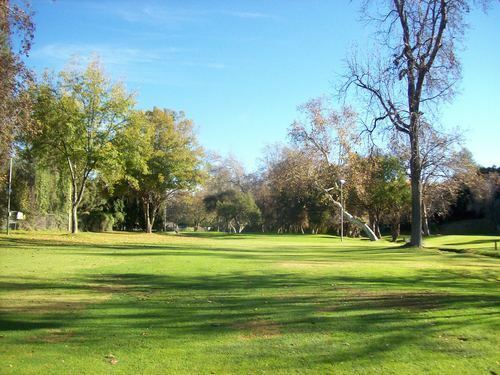 The course was in pretty mediocre shape, though. 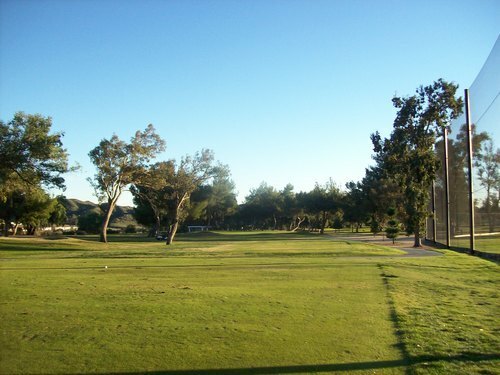 The tee boxes were okay, but the fairways were very hit and miss. A couple holes like #7 seemed better than others. There was not really much rough to speak of. 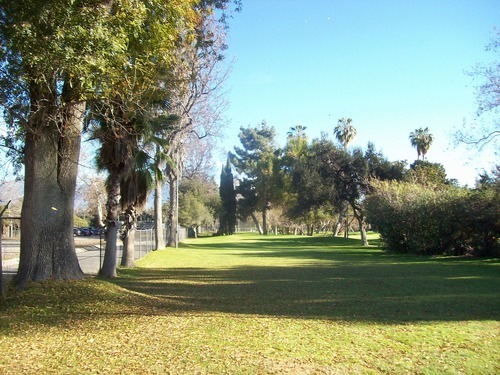 It was all cut down to about the same level as fairway and then the patchy turf just kind of blends into the outermost edges, which were more dirt than grass. Around the greens there was a bit more grass to work with, but there were plenty of mushy spots, too. The greens were bumpy and slow. I wasn’t in a bunker, so no comments there. There were plenty of people out here on a picture perfect Saturday morning. 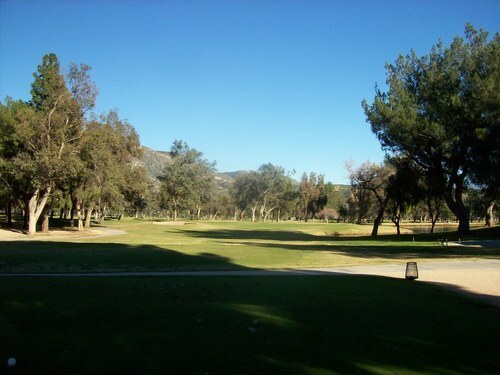 However, I had no problem getting out on the course and around in a pretty timely manner. The price was $16 for 18 holes. I was stuck behind some groups for much of the front nine, but then the twosome directly in front of me left after nine and that opened things up. The groups ahead started letting me play through and the back nine went relatively quickly. 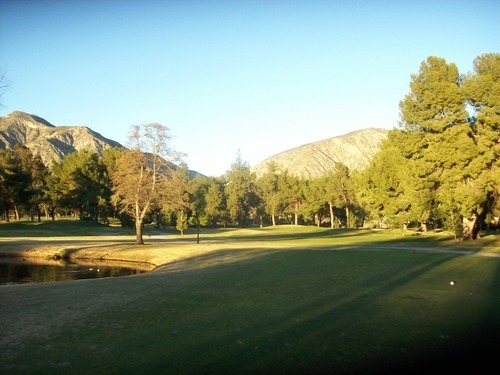 Arroyo Seco is an 18-hole par-3 course set in a small park that’s tucked back into a little canyon. There’s a big tennis complex next door and some other public areas around. The layout is pretty straightforward, but there are a handful of tricky holes. 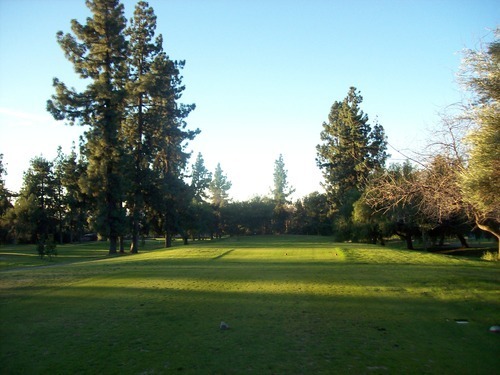 The latter half of the back nine runs along a hillside and there are some big trees hanging out that you have to contend with at times. 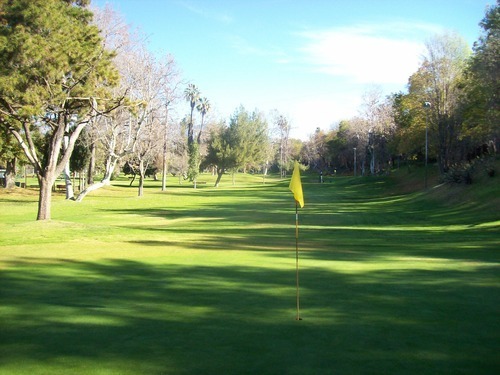 This would be considered a “pitch and putt” course by most with holes ranging from 91 yards up to 143, so you won’t need to bring many clubs with you. 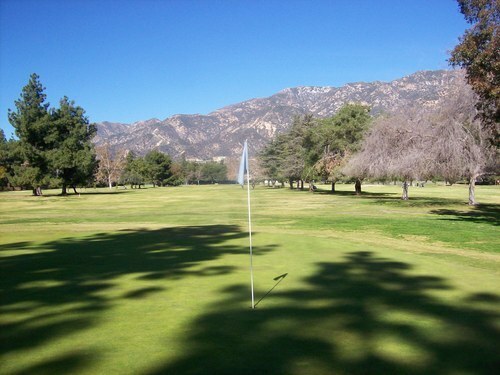 Of all the courses I played Saturday, I thought Arroyo Seco was by far the best conditioned. 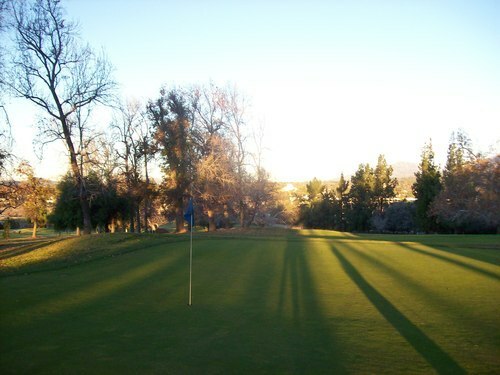 The greens were very soft and perhaps a bit too slow, but most of the course was pretty lush and nicely kept. They have mats for the tee boxes here, so that is a detraction for some, though I did see a few people teeing it up on the grass just in front of the mats. They do have a driving range here, some short game practice areas and even a miniature golf course for added entertainment. So, this is definitely a good place for beginners and kids. Even the most serious golfers can have some fun out here! It was around 10:30 by this point, so I figured that tournament group was long out of the way. However, when I checked back in, the guy informed me they were just making the turn. I gave him a bit of grief because earlier he had made it sound like it would be open after 9:30. What he really meant to say was that there was a small window around that time before this big group came around again. Ugh. I asked if I could try and jump out ahead of those guys and thankfully, he let me start on the 2nd hole. The regular walking price would have been $20.25 just like at Eaton Canyon, but I felt compelled to get a cart knowing I was starting (and finishing) on the 2nd. It was an extra $11, but ultimately I was glad I had it because there was a lot of waiting around once I was out on the course. It was nice having a shaded place to sit. It took a couple holes to catch the groups ahead and then it was really slow after that. I swear it felt like a 3-hour nine, but it was really only about 2:20. I did have ample time to stop at the unofficial “turn” (after the 5th hole) to grab a very tasty hot dog and a drink. 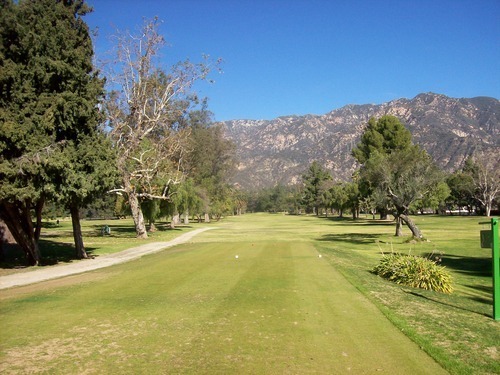 Like Eaton Canyon, Altadena is a regulation-length 9-hole course. It plays to a par of 36 and from the blue tees tops out at 3,039. That’s not long by today’s standards, but it’s no pushover. 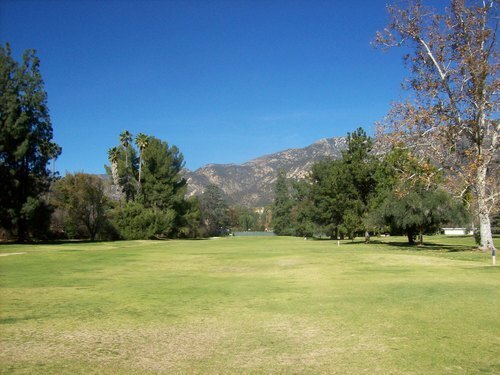 That said, I ended up liking Altadena much less than Eaton. 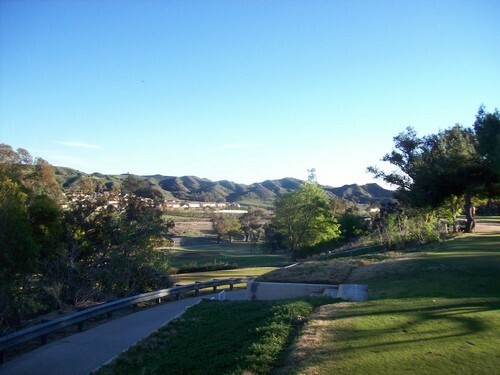 Though it does also offer some nice foothill scenery, as well, the layout is a bit more flat and open. It’s a pretty basic design overall. Conditions were similarly mediocre here. It looked worse than it played, though. 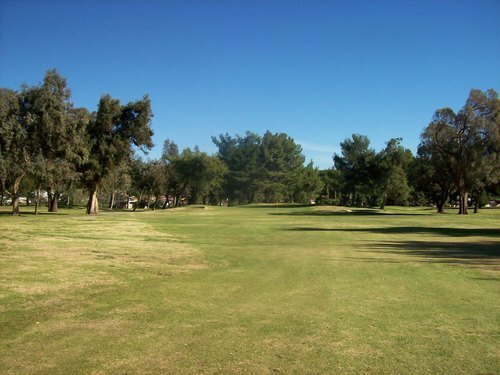 Everything was pretty dry and browned out, but the fairways were generally pretty decent and more consistent than at Eaton. The tee boxes were fine, though a few could use some leveling out. The rough was not much of a factor here either. 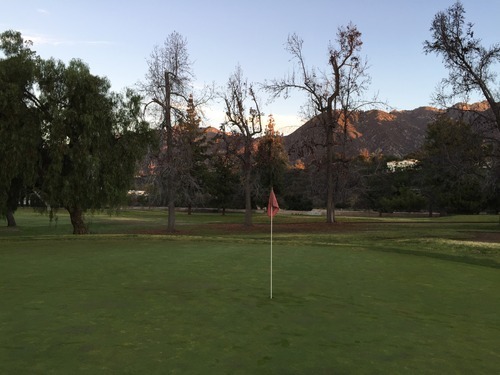 The greens were definitely a little nicer at Altadena. They were firm and faster than they looked, but still somewhat bumpy and inconsistent on putts. I was in one bunker and it had really good sand. 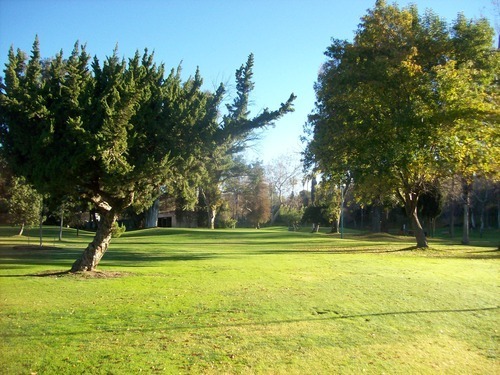 It’s hard not to pair Eaton Canyon and Altadena together. 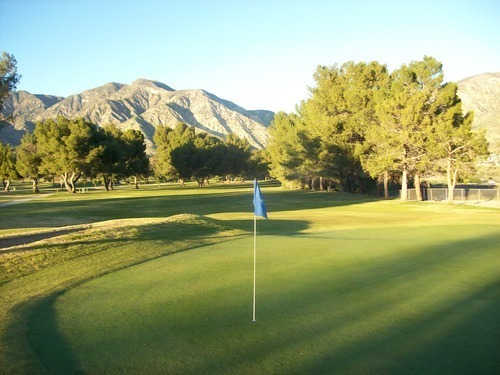 They are geographically close to one another and it’s not too much of a stretch to want to play both and pretend it’s a typical 18-hole round on a regulation course. However, of the two, I personally preferred Eaton because the hills and trees offered a more interesting setting and layout. On such a nice Saturday afternoon, I was pretty worried El Cariso would be very crowded. It was, but it still worked out okay. I got an afternoon rate of $25.50 with a cart (would have been $17.50 to walk) and then got in line at the first tee. I joined up with another single and we were stuck behind a few really slow groups for most of the front nine. Once we saw there were some open holes ahead, we got a bit more aggressive and were able to play through a couple of those groups. The back nine opened up more. We played through one more slow group on the 13th and then it was smooth sailing after that. 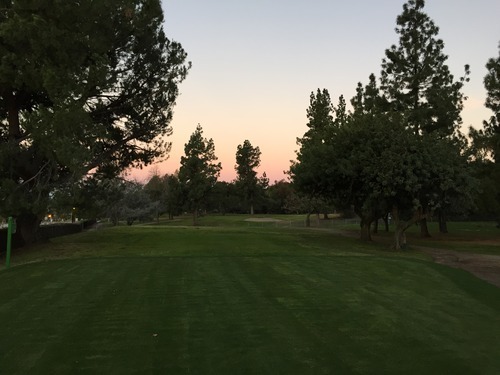 We started around 1:30 and finished just before 5:00 as we were racing to get all the holes in before dark. 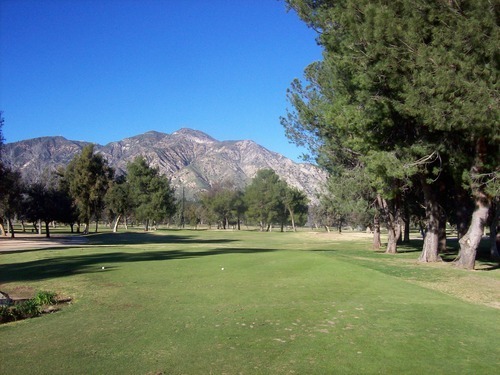 El Cariso is an 18-hole executive track with 10 par-3s and eight par-4s. 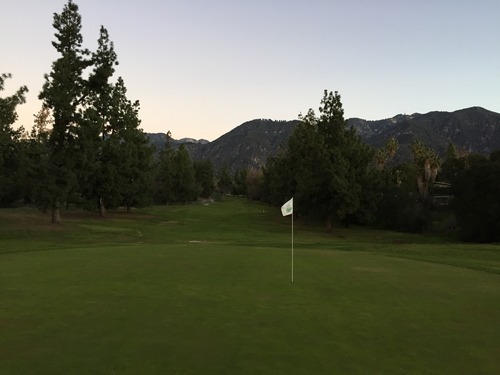 The par-4 holes are reasonable. There’s one really short one at 290 yards, but then there are a couple longer ones in the 390 range. Likewise, all the par-3s are pretty legit. From the blue tees, the shortest one is 127 and there are two that are 196 yards. 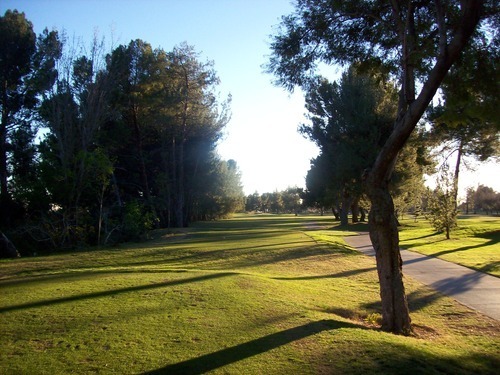 It’s not a tough course by any stretch, but it definitely offers more challenge than your average executive with mostly short holes. In my head, I envisioned this course being more hilly and interesting in terms of the layout because of where it’s located. I was wrong in my expectations. For the most part, it’s pretty flat and straightforward. 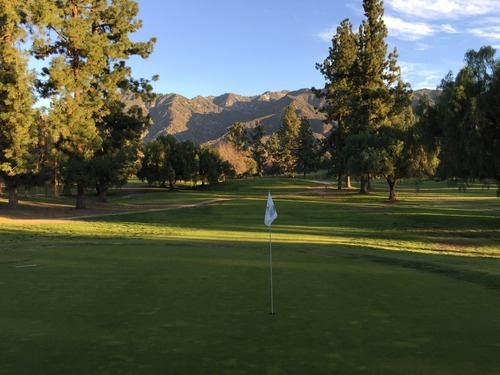 There are some water hazards in play on the front nine and then the back nine does have a few fun holes like numbers 11, 12 and 15. Otherwise, what you see is what you get. 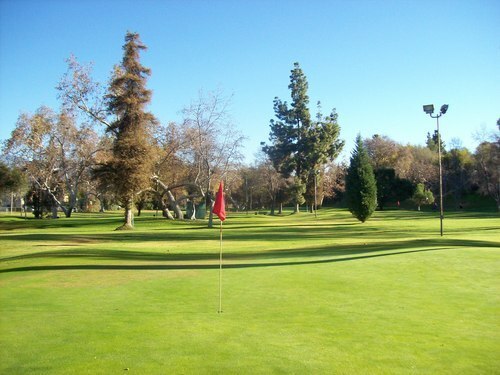 This course also played better than it looked, but was still in pretty much dormant winter condition. The tee boxes were decently kept, though some of them were way off-level. 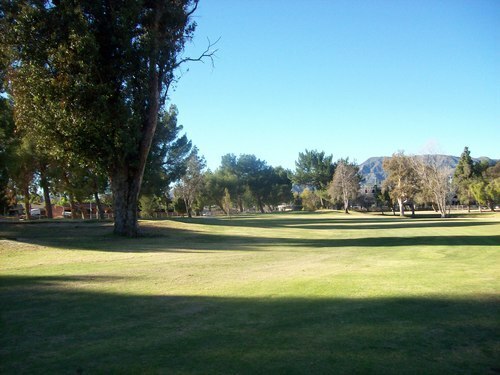 The fairways and rough were pretty brown and dried out, but the lies were generally fine enough. In front of the greens, the fairways/collars would get a bit mushy, so anything landing short would just stick and stop. 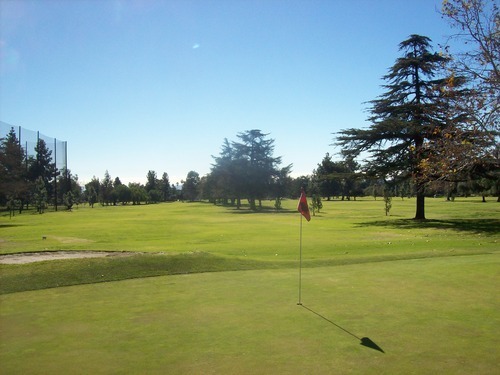 The greens were relatively firm, but would hold well-struck shots well. They were fairly quick on putts and I found them to be pretty deceptive all afternoon. I wasn’t in a bunker, but my partner was and it sounded like they were pretty thin. 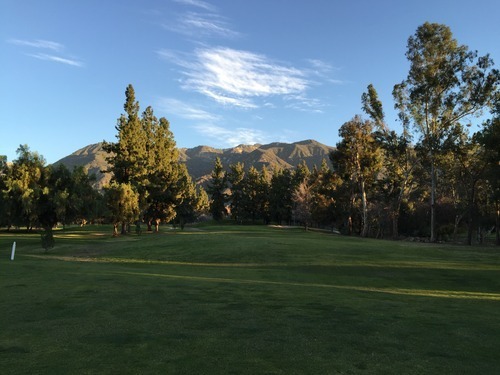 I can understand why El Cariso is a pretty popular course. However, it’s definitely a “one and done” for me. 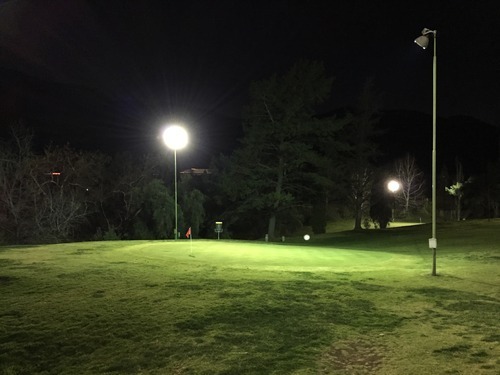 In a way, it’s fitting that the last short course I played in LA County was under the lights. Many of the ones I’ve visited have had lights, but this was the only one where I needed them. It was also fortunate I had my new iPhone with me because it did pretty well with the night photos when I know my normal camera would struggle mightily. 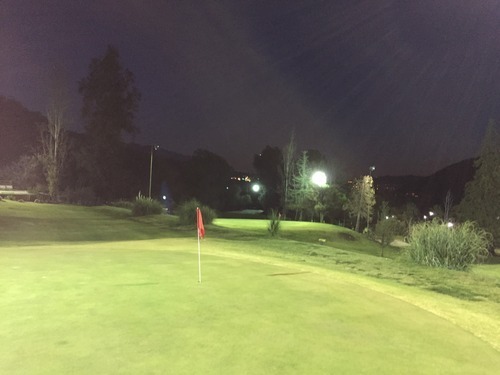 The lights here aren’t fantastic, but they do get the job done on a pitch and putt course like Verdugo. The 10th green was completely blacked out, though, and that was creepy. 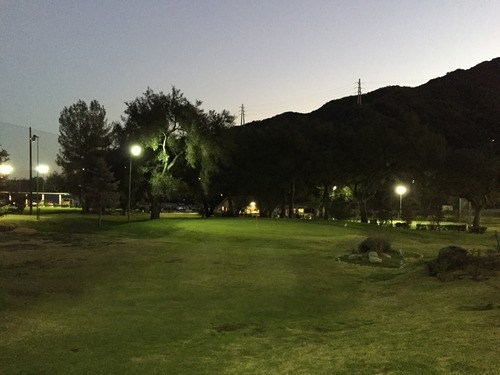 Perhaps the biggest story at Verdugo is that it doubles as a disc golf course. I’ve seen this a number of places, too, and it can get complicated if things are busy. 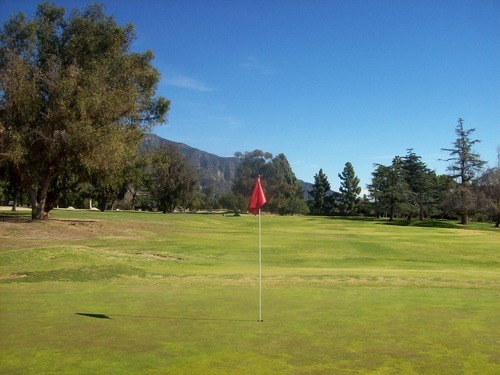 And it was fairly busy out at Verdugo during my round. 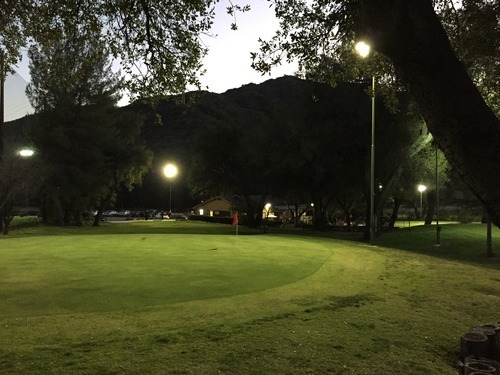 There were golfers of both types out on the course (more discers than us regulars, though) and the darkness only made things more complicated and dangerous with all the overlap. The price for 18 holes of golf was $15. I played through a couple groups and also got quite creative with the routing, looking for open holes where I could to avoid other players. I eventually got through the whole course in about 1.5 hours. 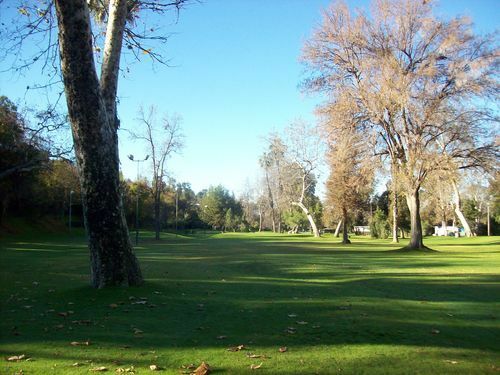 Verdugo Hills is an 18-hole par-3 course that is definitely a pretty basic “pitch and putt” layout. It is built on a hillside, so that adds some intrigue going up, down and along the slope. There are some holes here in the 70-yard range and a couple listed at 140. However, I learned that nothing plays nearly that long. When I flew the first of those “longer” hole greens by a mile, I figured the measurements were a bit off and got more conservative after that. 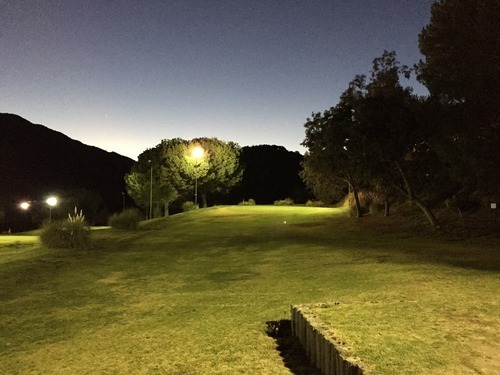 Long is not a good place to be here because it’s hard to find your ball at night if it goes too far. 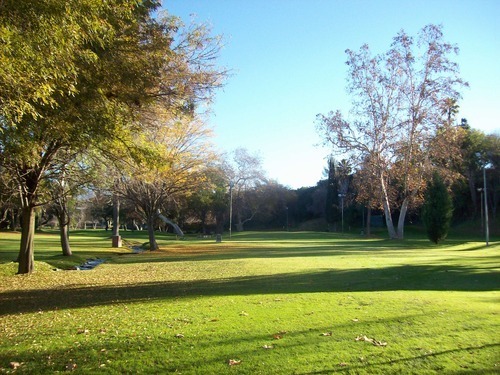 Obviously, the tees and greens are what matter most on a course like this. The tees are mats, so they are what they are. The greens were decent and quicker than they looked. There are some sneaky slopes here because it’s an old course on a hillside, so be careful on downhillers! Everywhere else, I thought the course was in pretty reasonable winter condition with pretty consistent grass coverage throughout. 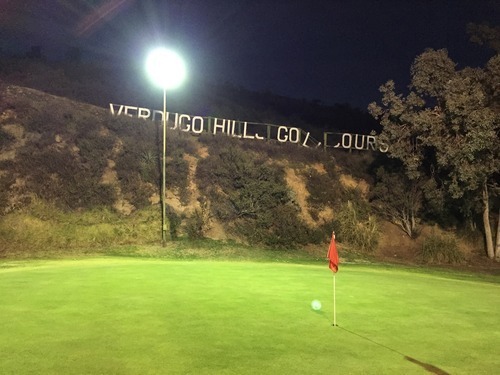 Verdugo is a pretty fun course and probably even more fun at night. 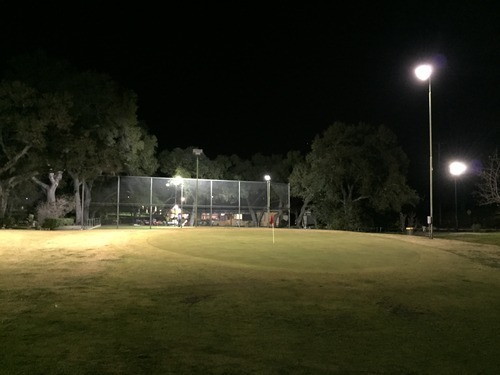 I’m sure the influx of disc golfers is good for business, but it does complicate things a bit on a busy day (or night) here. 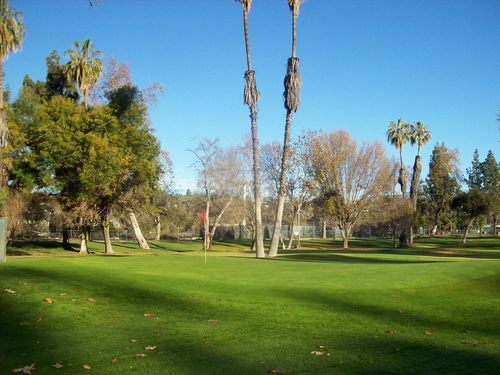 So, this closes one chapter on my Short Course Blitz quest and now I’ve played every public course in LA County. I still have many private clubs to try and access. 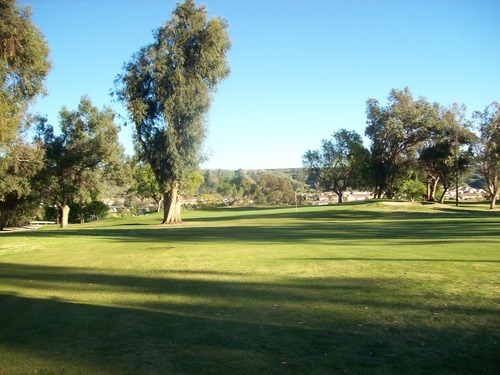 As for short courses, I still have one grouping left down in San Diego County and then a few “stragglers” in more outlying areas that I’ll get to eventually. No huge rush on some of those.